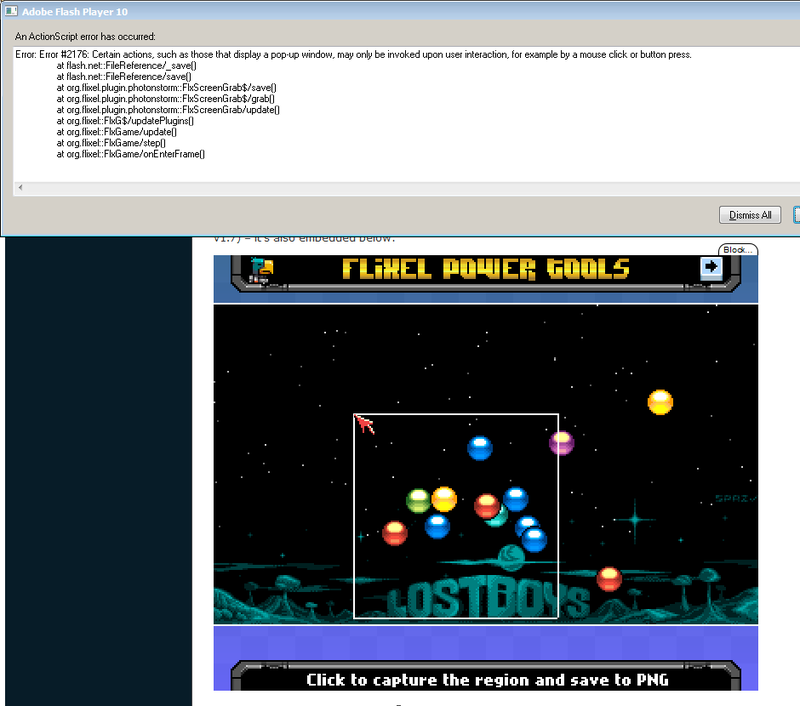 Photon Storm » Blog Archive » Flixel Power Tools v1.7 – Kaboom! Posted on June 16th 2011 at 11:58 pm by Rich. « DAME 2 Released – My Favourite Game Map Editor! Awesome! The TestSuite really does a great job at demonstrating the various features and the Tests sourcecode serve as a good minimal demonstration of how a specific feature is used. And as it’s easily embeddable people don’t even have to download anything from github to give the powertools a try. Me like! Flixel Power Tools is amazing! Yeah the F1 capture only works when the swf is run locally. It’s because of the sandbox security, it needs to be invoked from a MouseClick event, otherwise it trips up Flash. I’ll sort it out one day really it was meant for devs to take shots of their games as they play them – but I can see it would be useful in an actual live game too sometimes! great stuff, thank you rich. I think I’m experiencing a bug with FlxBar. I have a variable set so whenever an enemy dies, said variable is set -= 1. Also another variable that tracks enemies killed is set += 1. The problem is that so long as the FlxBar is added, those variables seem to suddenly get streaky – enemies killed will jump up suddenly (double or more) by far more enemies than have actually been killed, and the other variable will decrease rapidly the same way. Not really obvious from the code posted above, email me a project I can compile and I can take a look. When I create a button using FlxButtonPlus class with a height which is smaller than default value (20px) then label of the button goes out of the button border by y-axis! It is because y-position of the label is fixed to Y+3 coordinate.